Teleflo magnetic level indicators are quickly replacing outdated level technology, providing redundant, non-invasive level control. Together with a guided wave radar in a chamber next to the magnetic level indicator, Teleflo MLIs offer a low maintenance solution for both high accuracy and local indication. The float chamber is basically a column of 2-1/2 inch pipe with process connections to match those of the storage tank, reactor, or other equipment where level is to be measured. These connections may be side couplings or flanges, or top and bottom flanges. The magnetic float moves up and down inside the chamber as the process level changes. Float type is determined by the process fluid, light enough to maintain buoyancy and have properties that allow it to withstand the temperature and pressure combination. Contained inside the sealed float is a 360 deg. magnet assembly. The indicator tube and scale assembly are attached to the float chamber (standard scale is in feet and inches). The indicator tube is available in polycarbonate or glass (temperature limit on polycarbonate is 250 deg. F). Inside the indicator tube is a lightweight magnetized indicator or series of metallic flags. 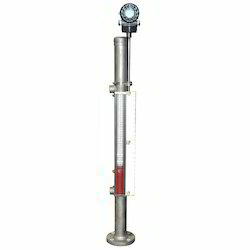 The indicator is magnetically coupled to the float and moves up and down with the liquid level. The indicator allows the operator to read the level from more than 100 feet away. The only moving parts are the float and the indicator. Magnetic Level Gauge are quickly replacing outdated level technology, providing redundant, non-invasive level control. Together with a guided wave radar in a chamber next to the magnetic level indicator, Teleflo MLIs offer a low maintenance solution for both high accuracy and local indication. 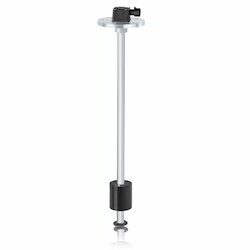 PP Magnetic Level Gauge are quickly replacing outdated level technology, providing redundant, non-invasive level control. Together with a guided wave radar in a chamber next to the magnetic level indicator, Teleflo MLIs offer a low maintenance solution for both high accuracy and local indication. 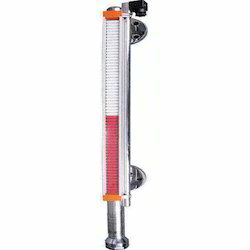 Looking for Magnetic Level Indicator ?